By: Diane Kashin, Ed.D, RECE. It is heartening to see that there is much interest in the Reggio Emilia Approach and a genuine desire expressed by many to begin the process of becoming Reggio inspired. Thinking about our practice as a journey has me pondering. 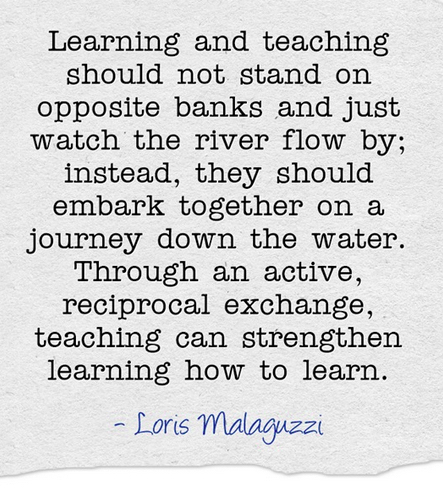 Metaphors are a useful tool to promote reflective thinking about practice and I am reminded of the Malaguzzi quote that likens the process to a journey down the water of a river. Becoming Reggio inspired is a complex process that cannot happen in a short time. In my soon to be released textbook “Empowering Pedagogy” Beverlie Dietze and I reflect on the journey metaphor using it as a way to describe the life long process of early learning professional practice. If you explore the metaphor of a journey and think about travelling across a challenging landscape with an uneven terrain you will recognize that it will not be an easy road ahead. Some parts of the journey will have a defined destination with a map; others may be spontaneous and discovered without a plan. Journeys can be both pleasurable and difficult. Wherever you are in your own journey, it is beneficial to reflect on your practice. 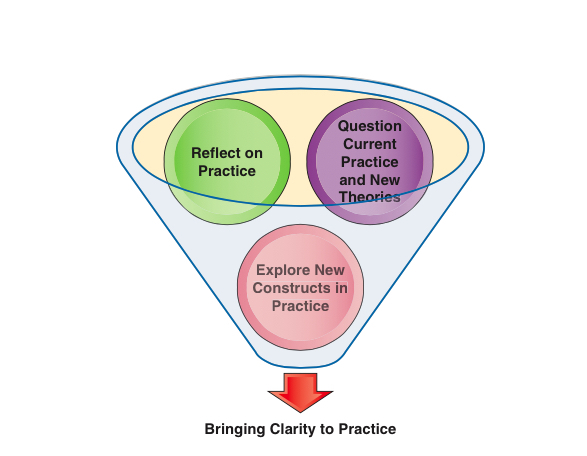 Imagine a funnel that sifts together reflection on practice, questioning current practice and considering new theories while exploring new constructs. This will help you bring clarity to your own practice. Pedagogical documentation is a professional tool that can be used to examine your practice and is a necessary component to becoming Reggio inspired in practice. It focuses on the teacher as researcher who looks for opportunities to reflect and question. Dahlberg, Moss and Pence first introduced the term pedagogical documentation in 1999. This book will help you question and reflect. It has helped to open my mind to multiple perspectives. Carol Ann Wien (2011) describes pedagogical documentation as “the teacher’s story of the movement of children’s understanding”. Learning in motion helps us to grasp the idea that the learning is dynamic. 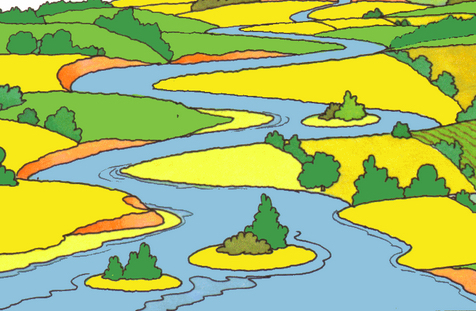 “If we are to think of learning as being like a river, capable of flooding and of drying up or like clouds, massing up an dispersing, we might have an apt metaphor for the ways our minds and bodies work“. The metaphors of journeys, rivers and roads suggest a level of uncertainty in your travels. You need to expect to face challenges and setbacks. There are those out there who want to make your journey easier. They are your critical friends, colleagues, and mentors. Margie Carter and Deb Curtis have been inspirational mentors to me for many years and I have had the privilege to meet them and work with them on a number of occasions. In her article “Doing Reggio” Margie references a book of conversations between two educational giants Myles Horton and Paulo Freire (1990), We make the road by walking: Conversations on education and social change and reminds us to make our own road. Reggio inspired practice is a process that begins with a first calculated step. 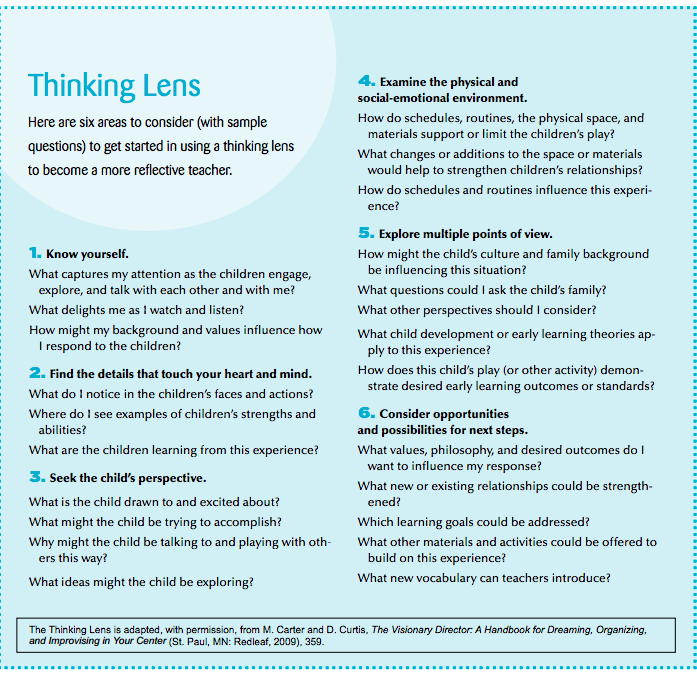 Consider Margie and Deb’s “Thinking Lens for Reflective Practice” as a guide for your travels. #ReggioPLC Twitter chats have been a wonderful way to connect with others near and far who have been brought closer by the power of social media who are ready, willing and able to provide support to those who aspire to be Reggio inspired. We are all on a journey– some further down the river or along the road, others taking the first step and still others facing obstacles, roadblocks or mountains to move. No matter what point you are at in your journey you will face obstacles. You may need guidance or reassurance. I am so grateful to have found Suzanne Axelsson because of her listening ear! She helps me keep the waters flowing. From across the pond – I recently found a new friend with the help of Facebook Debi Keyte-Hartland whose blog has inspired me to think deeply from different perspectives. I look forward to making a real time connection with Debi in the future just like I have been able to do with Suzanne as she has visited me here in Canada and I will be visiting her in the spring when I journey to Sweden. A journey is a useful metaphor to consider professional practice. Whenever you travel you prepare and pack. To embark on a journey of Reggio inspired practice, take with you an open mind, an open heart, a listening ear and a thinking lens. Fill your tanks, set your sails, open your minds, open your hearts, and take the hand of a friend or colleague, a mentor or guide. Don’t worry about where you are going. Trust the journey and you will get to where you need to be. “Don’t worry about where you are going. Trust the journey and you will get to where you need to be.” A very POWERFUL thought Diane. Thank you! Terrific post, Diane! Love the focus on listening and reflection. Thanks Matt! I appreciate your comment. Listening and reflection are not always easy but so important in practice and theory.